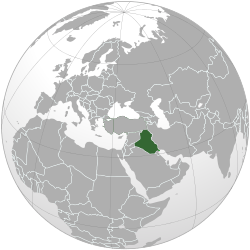 The Kingdom of Iraq under British Administration or Mandatory Iraq (Arabic: الانتداب البريطاني على العراق‎‎ al-Intidāb al-Brīṭānī ‘Alá al-‘Irāq) was created in 1921 following the 1920 Iraqi Revolt against the proposed British Mandate of Mesopotamia, and enacted via the 1922 Anglo-Iraqi Treaty. Three important anticolonial secret societies had been formed in Iraq during 1918 and 1919. The League of the Islamic Awakening (Jamiyat an Nahda al Islamiya) was organized at Najaf. The Muslim National League (Al Jamiya al Wataniya al Islamiya) was formed with the object of organizing and mobilizing the population for major resistance. In February 1919, in Baghdad, a coalition of Shia merchants, Sunni teachers, and civil servants, Sunni and Shia ulama, and Iraqi officers formed the Guardians of Independence (Haras al Istiqlal). The Istiqlal had member groups in Karbala, Najaf, Kut, and Hillah. Ath Thawra al Iraqiyya al Kubra, or the Great Iraqi Revolution of 1920, was a watershed event in contemporary Iraqi history. For the first time, Sunnis and Shias, tribes and cities, were brought together in a common effort. In the opinion of Hanna Batatu, author of a seminal work on Iraq, the building of a nation-state in Iraq depended upon two major factors: the integration of Shias and Sunnis into the new body politic and the successful resolution of the age-old conflicts between the tribes and the riverine cities and among the tribes themselves over the food-producing flatlands of the Tigris and the Euphrates. The 1920 rebellion brought these groups together, if only briefly; this constituted an important first step in the long and arduous process of forging a nation-state out of Iraq's conflict-ridden social structure. The final major decision taken at the Cairo Conference related to the new Anglo-Iraqi Treaty of 1922. Faisal was under pressure from the nationalists and the anti-British mujtahids of Najaf and Karbala to limit both British influence in Iraq and the duration of the treaty. Recognizing that the monarchy depended on British support— and wishing to avoid a repetition of his experience in Syria — Faisal maintained a moderate approach in dealing with Britain. The treaty, which had been originally set as a 20-year engagement but later reduced to four years, was ratified in June 1924; it stated that the king would heed British advice on all matters affecting British interests and on fiscal policy as long as Iraq had a balance of payments deficit with Britain, and that British officials would be appointed to specified posts in 18 departments to act as advisers and inspectors. A subsequent financial agreement, which significantly increased the financial burden on Iraq, required Iraq to pay half the cost of supporting British resident officials, among other expenses. British obligations under the new treaty included providing various kinds of aid, notably military assistance, and proposing Iraq for membership in the League of Nations at the earliest moment. In effect, the treaty ensured that Iraq would remain politically and economically dependent on Britain. While unable to prevent the treaty, Faisal clearly felt that the British had gone back on their promises to him. On 1 October 1922, the Royal Air Force in Iraq was reorganized as RAF Iraq Command, and given control of all British forces in the kingdom. On 3 October 1932, the Kingdom of Iraq became a fully sovereign country. The Iraqi Kingdom under the Hashemites lasted until 1958. ↑ Overseas commands: Iraq, India and the Far East, section "RAF Iraq." In: Air of authority: A history of RAF organization. Retrieved 2015-06-20. Jacobsen, Mark. "'Only by the Sword': British Counter‐insurgency in Iraq," Small Wars and Insurgencies 2, no. 2 (1991): 323–63.